Half of the 20 million new STDs reported each year are among young adults 15-24. 70% of Gonorrhea cases in the US come from people aged 15-24. 63% of Chlamydia cases in the US come from people aged 15-24. 49% of HPV cases in the US come from people aged 15-24. 45% of Herpes cases in the US come from people aged 15-24. 21-26% of HIV cases in the US come from people aged 13-24. Nationally, nearly 210,000 babies were born to mothers aged 15–19 years in 2016, for a birth rate of 20.3 per 1,000 women in this age group. In NYS, there were 16,196 pregnancies in women aged 15-19 in 2016, for a pregnancy rate of 26.7 per 1,000 females in this age group. 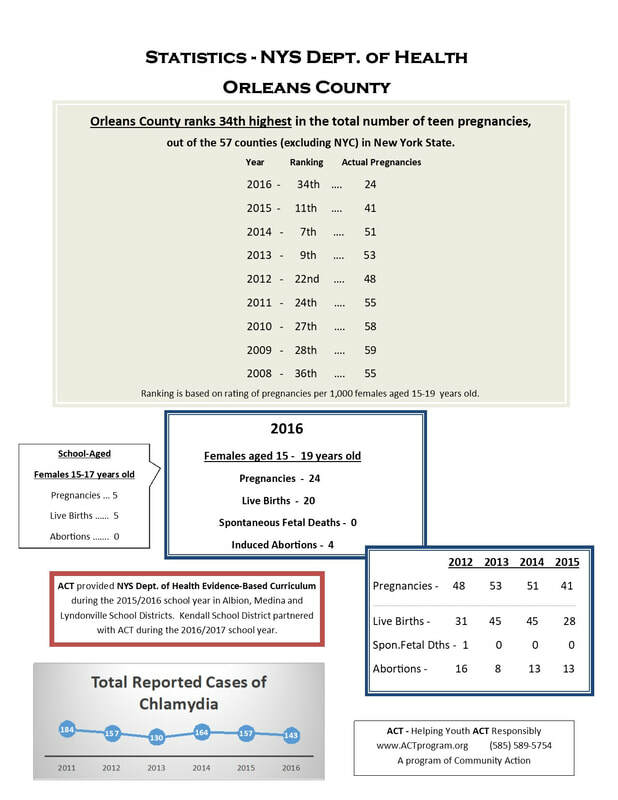 In Orleans County, there were 24 pregnancies in women aged 15-19 in 2016, for a pregnancy rate of 20.2 per 1,000 females. (Leaving them ranked 34th out of 57 counties, excluding NYC). 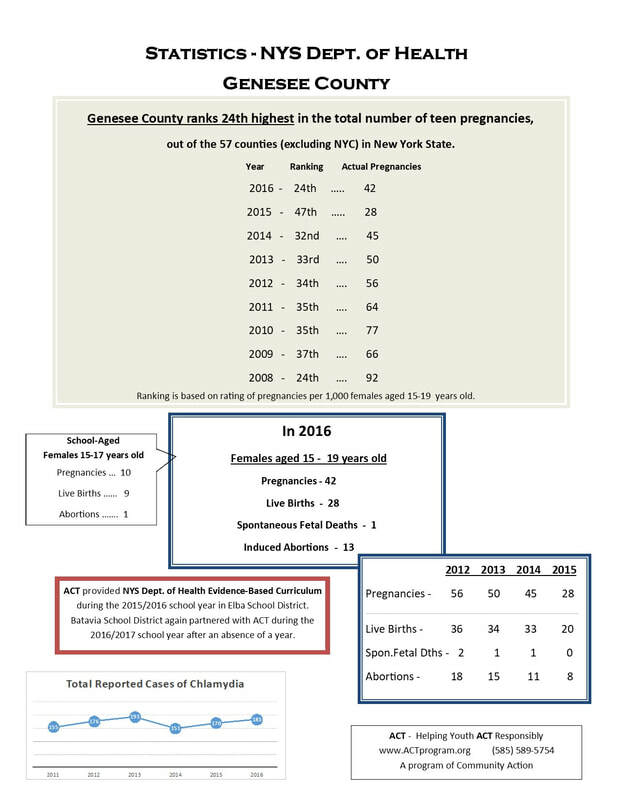 **Overall, Rates of teen pregnancy have been decreasing, with evidence suggesting that these declines are due to more teens abstaining from sexual activity and more teens who are sexually active using birth control than in the past. By age 22, around 50% of teen mothers have received a high school diploma and only 30% have earned a GED (whereas 90% of women who did not give birth during adolescence receive a high school diploma). Only about 10 percent of teen mothers complete a two- or four-year college program. Teen fathers have a 25 to 30 percent lower probability of graduating from high school than teenage boys who are not fathers. be unemployed or underemployed as a young adult. ​Young people aged 15–24 years acquire half of all new STDs (even though they only make up 27% of the sexually active population), with 1 in 4 sexually active adolescent females having an STD currently, and 1 in 2 people expected to have an STD by the time they are 25. ​HIV Statistics . . .
From 2010 to 2015, estimated annual HIV infections declined 24% among youth, although youth aged 13 to 24 still made up 21% of all new HIV diagnoses in the United States in 2016. 81% of those HIV diagnoses were attributed to male-to-male sexual contact (2016). Additionally, in adolescent males, 4% of cases were attributed to heterosexual contact, 3% were attributed to male-to-male sexual contact and injection drug use, and 1% to injection drug use alone (2016). In adolescent females, 87% of infections were attributed to heterosexual contact and 9% were attributed to injection drug use (2016). Having a very low level of virus in the body (suppressed viral load) helps a person stay healthy and reduces the risk of transmitting HIV to others. Youth with HIV are the least likely of any age group to be linked to care in a timely manner and have a suppressed viral load. 112,919 people in NYS are living with HIV and or AIDS (571.9 per 100,000). 591 people 13-19 are living with HIV and/or AIDS (31.8 per 100,000). 2,776 people 20-24 are living with HIV and/or AIDS (199.4 per 100,000). 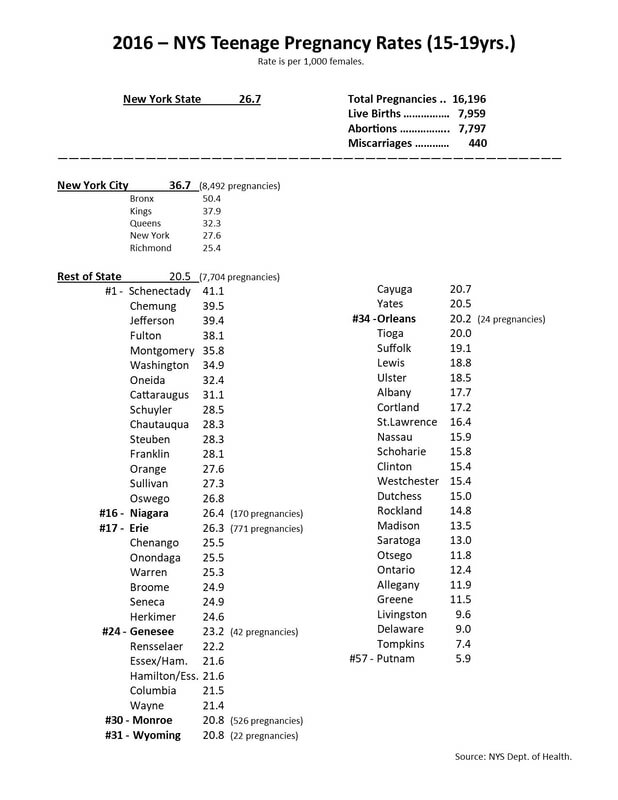 71% of people living with HIV in NYS are male, and 29% are female. 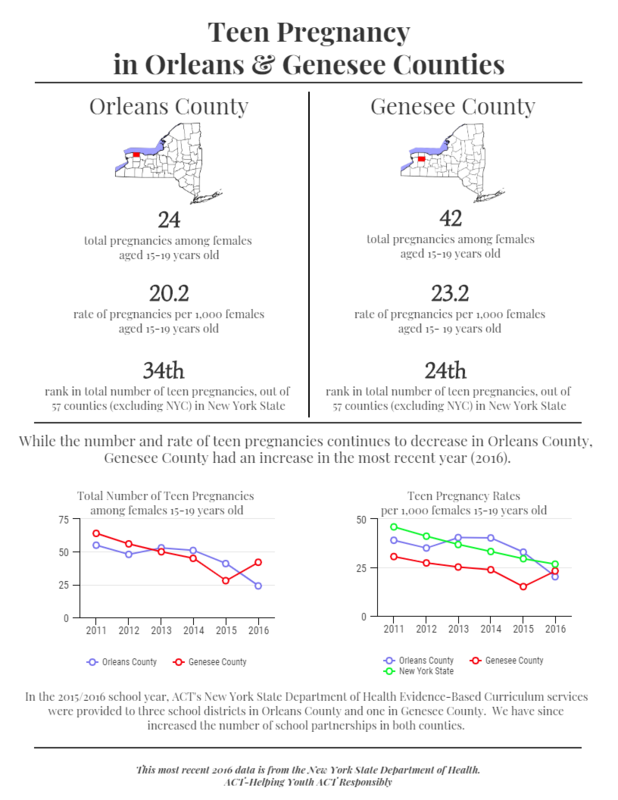 Rates of HIV and AIDS diagnoses and existing cases have decreased over time in Orleans County. Currently…..
50 people in Orleans County (Excluding State Prison Inmates) are living with HIV and/or AIDS (77.4 per 100,000). 0 of these cases are in people birth- 19 years old. 3 cases are in people 20-29 years old. when they were infected or when they were diagnosed. 131 people in Orleans County (Including State Prison Inmates) are living with HIV and/or AIDS (179.0 per 100,000). 0 cases are in people birth-19 years old. 3 cases are in people 20-29 years old. 57 people in Genesee County (Excluding Prison Inmates) are living with HIV and/or AIDS (97.5 per 100,000). 0 of these cases are in people birth- 19 years old. 7 cases are among people 20-29 years old. 72 people in Genesee County (Including Prison Inmates) are living with HIV and/or AIDS (123.1 per 100,000). 0 of these cases are in people birth-19 years old. 8 cases are among people 20-19 years old. The center for Disease control recommends all adolescents and adults (aged 13-64 years old) get tested for HIV at least once as part of routine medical care.